Twin roll casting is a relatively short single step casting process which is primarily used for thin, mm gauge aluminum sheets. In comparison to the more traditional direct chill casting process TRC provides and number of attractive economic and quality advantages. Twin-roll casting (TRC) is proposed as an alternative to conventional direct chill (DC) casting followed by hot rolling, a proven technology for economical production of thin aluminum sheets directly from the melt. TRC is a shorter process route that combines casting and dynamic hot deformation in a single step and is suitable for the production of thin sheets (mm gauge). The method involves pouring the melt into the gap between two rotating and water-cooled cylindrical rollers. The metal solidifies just before reaching the bite of the rollers and is then rolled as it passes through the rollers. Compared with conventional DC casting, the TRC technique can lead to reduced capital and operating costs, less energy consumption, and a reduced scrap rate. In the TRC process, several methods have been used for controlling the microstructure and thus the mechanical properties. The benefits of TRC were verified among others on Al-Mn-based alloys. Aluminum-manganese alloy AW3003 is commonly used as fins in automotive heat exchangers. Its standard composition is given in Tab. 1. The foils for heat exchangers can be produced either by direct-chill casting (DC) or twin-roll casting (TRC). The use of TRC instead of DC leads to a lower energy and work consumption, higher production rate and thus lower foil costs, but also to the different initial microstructure. Foils produced by TRC exhibit higher solid solution supersaturation, finer dispersion of primary phases and finer grains elongated in the casting direction. Therefore, production of TRC materials requires modifications of the processing route which is used for DC materials. During twin-roll casting the molten metal is directed through a ceramic tip between two water cooled lubricated rolls. By combination of the solidification and rolling process strips 10–0.5 mm in thickness are produced. The solidification rate around 100 K/s is higher at the surface than in the centerline of the foil [Sun et al., 2006]. Higher casting rates increase the productivity but can cause a macro-segregation in the central part of the foil (Figure 1). The two limiting surfaces of the TRC foil solidify first inducing the solute enrichment of the liquid. Solute-rich areas with eutectic features parallel to the casting direction are formed when the two solidification fronts reach the foil center. The segregation is more pronounced in materials with a higher content of alloying elements and longer freezing ranges and segregates cannot be removed by a homogenization treatment. The microstructure of the TRC foils varies through the thickness of the foil: near the surface the number density of primary particles is higher and grains are smaller as compared to the center of the foil. The number of dispersoids precipitated during the heat treatment is higher in the center. The central grains are more or less equiaxed whereas the surface grains can be elongated in the casting direction (Figure 2) or very fine thanks to the recovery and dynamic recrystallization caused by hot-rolling component of twin-roll casting. 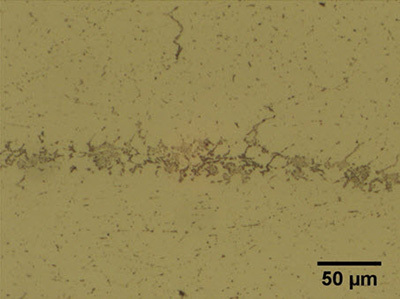 Figure 2: Light optical micrograph of the grain structure of a twin-roll cast AW3003 alloy. Surface grains are deformed and elongated in the casting direction (left), grains in the center are coarser (right). The aims of study presented in a paper of Min-Seok Kim, Yoshiyuki Arai, Yasuharu Hori, and Shinji Kumai, was to investigate the effect of casting conditions on the occurrence of internal defects for 6022 aluminum alloy, which has a wide freezing range. Through a microstructure observation of the cast strip and a direct temperature measurement during the HSTRC, solidification behavior of HSTRC 6022 alloy is discussed, compared with that of HSTRC, a pure aluminum with no freezing range. The solidification structure was observed at a steady state section of the cast strip where the strip thickness was uniform. Optical microscopy observation was carried out on transverse cross sections of the cast strip. Polished specimens were anodized at 20 V and a current density of 0.2 Amm-2 for 90 s in a 2% solution of HF. A crack surface of the cast strip was observed by using a scanning electron microscope. Commercial 6022 aluminum alloys and pure aluminums were cast to compare the solidification behavior in terms of solidification-type, i.e. the existence of solid/liquid coexistence layer (mushy layer) at the growth front of the solidifying shell on the roll surface or not. Figure 4 shows a grain structure of the transverse cross-section of pure aluminum and 6022 strips. Solidification structure of the pure aluminum strip exhibited columnar grains in the near-surface region and equiaxed grains in the central region, as shown in Figure 4(a). On the other hand, for the 6022 alloys, dendritic solidified shells were grown from the both roll surfaces. They consisted of fine columnar grains and they were gradually replaced by equiaxed grains, as shown in Figure 4(b). In the central region of the strip, a band of fine globular crystals was observed. Thickness of the central band was not constant along both transverse and longitudinal directions, but the difference in thickness of the band structure had little effect on the resultant strip thickness. 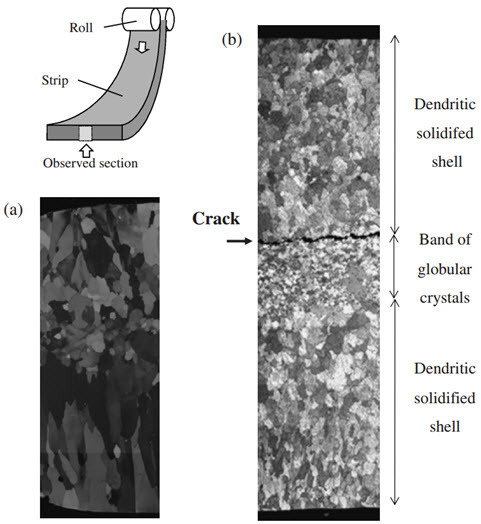 In the 6022 alloy strip, a large central crack was observed at around the interface between the dendritic solidified shell and the central band, as indicated by arrow in Figure 4(b).